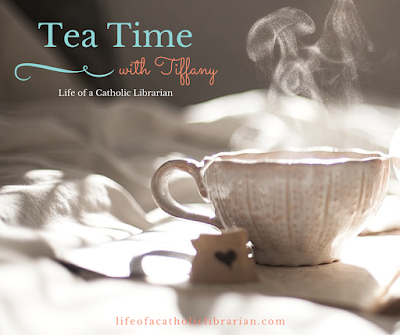 Life of a Catholic Librarian: Tea Time with Tiffany #33 - Winter fun & fitness! Today I actually did everything right, yay!!! So you should have much improved audio quality. As a result, you can hear my mini office refrigerator humming in the background. :0 At any rate, I talk about my New Year's resolution to be more creative in my fitness life, and discuss my foray into Zumba! Feast of Our Lady of Lourdes is February 11th. Her novena begins February 2nd, and you can sign up for daily emails of the prayers with Pray More Novenas. How are your New Year's resolutions going, dear reader? Any new fitness adventures to report in? Have you ever taken Zumba? And are you planning to pray the Our Lady of Lourdes novena as we move into February? Do write in and tell me all about it! I will talk to you again to respond to your comments and then again next Tuesday! God bless, and thank you for being here! So glad you are feeling better! Marvelous that you are trying out the Zumba class! Bet you'll do really well given your dance background. Count me in on the novena. New Years Resolutions- well I subscribed to The Word Among Us on my kindle and I've been reading the daily readings each morning. I've never been able to stick with it in the past, but so far so good and I'm realizing the more I stick with it, the better my concentration is and I'm truly enjoying it and actually looking forward to it. New things? Well, my husband and I have started skishoeing! The skis are called Altai Hok- have you heard of them? They're wider than cross country skis and you can break trail with them. So fun! And scary! Lol. Hope you have a great weekend as well! I will definitely be joinging for the Our Lady of Lourdes novena! Pray More Novenas is fantastic. Hi Catherine! Yes, I am very glad to be back in the land of the living. :) That was a rough go. Word Among Us, oohhhh, so glad to get your review! I've seen this many times, and it looks great, but I've never subscribed. Similar in content to what I'm doing, so we can be buddies in our daily morning Gospel reflecting. :) Great work on sticking to your resolution! I have not heard of skishoeing, how fascinating! I know that cross country skiing is excellent exercise, so I imagine this is fantastic as well. I'm so glad that you're trying something new!